VCFA in winter: The cold, cruel world is what we get when we leave here. Readers of this blog might have noticed the 10-day interval between my last entry and this one. 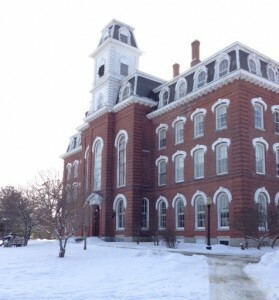 I have been quite busy during this time, once again as a graduate assistant at my MFA alma mater, Vermont College of Fine Arts in Montpelier. 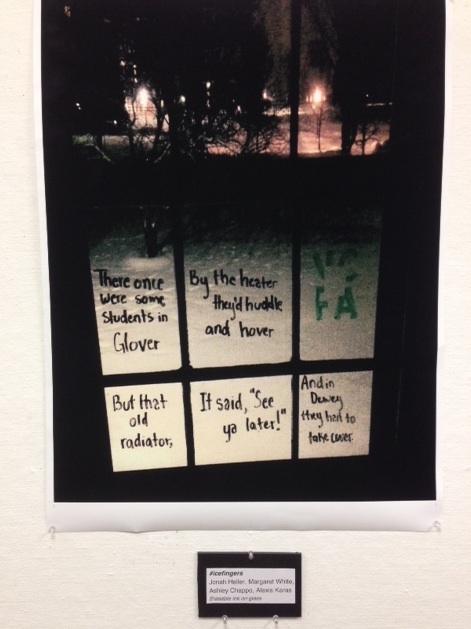 Normally, VCFA alumni don’t serve as graduate assistants two semesters in a row — and, not being a fan of winter, I pledged never to volunteer during this harsh season — but an emergency cancellation led me to say “yes” against their policies and my better judgment. 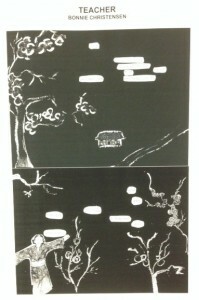 A student homage to Bonnie Christensen at the “Poetry Off the Page” exhibit. That said, it was not a decision I have regretted. On the contrary, this has been a residency notable for its emotional highs and lows, and I’m glad I could share both with friends and fellow members of my writing tribe. About two weeks before the beginning of the residency, VCFA students, faculty, and alumni received a message that Bonnie Christensen — a faculty member since 2011 — had entered hospice. In the summer residency, Bonnie gave a lecture titled “What Doesn’t Kill You…” about giving characters meaningful and difficult obstacles, with both the stakes and the level of challenge increasing as the story moves forward. Bonnie illustrated her points with the challenges in her own life, not only fighting cancer but also losing a boyfriend who did not wish to accompany her on this hard journey. Despite her struggles, Bonnie remained optimistic that she could beat her illness. She joked with other faculty members about her wigs, she gave full attention to her students and helped them with their challenges while not letting on about her much greater one, and she continued to create beautiful books for young readers, including a picture book biography of Elvis Presley, Elvis: The Story of the Rock and Roll King, which is due out in April. We had scheduled a celebration of Bonnie’s life on Friday, January 16 and hoped that we’d be able to send her photos and drawings from that celebration, but on Tuesday, January 13, we learned that she had passed away. 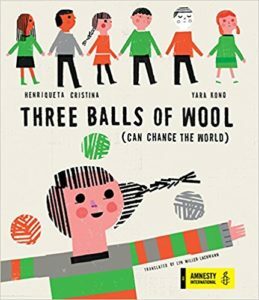 I was fortunate to have taken a workshop with Bonnie and Leda Schubert, with whom she collaborated on the picture book The Princess of Borscht, in winter 2012. Bonnie and Leda were close friends, a closeness evident in the way they ran the workshop. In that workshop, which focused on research for writers of all genres and age levels, Bonnie and Leda created an atmosphere of support and trust. While I learned a lot about the range of resources available to writers through VCFA and other libraries and appreciated the perspectives of other authors of historical, realistic, and speculative fiction such as Katherine Paterson and M.T. Anderson, the most valuable part of the workshop for me was how Bonnie and Leda listened to my concerns and gave me advice about interviewing people for my books. 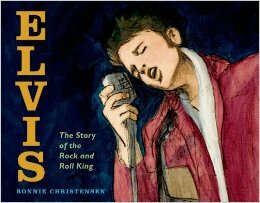 In addition to being a wonderful artist and writer, Bonnie was a perceptive, knowledgeable, and devoted teacher. 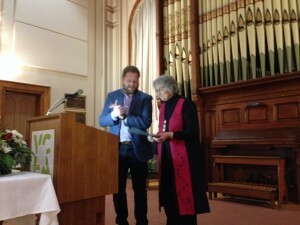 Katherine Paterson receives her honorary degree from VCFA. 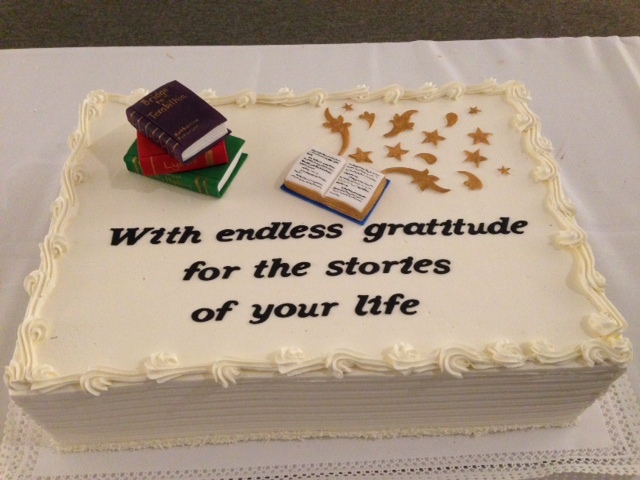 The evening before our celebration of Bonnie’s life, the VCFA community celebrated a far happier event — Katherine Paterson’s honorary degree from the college. 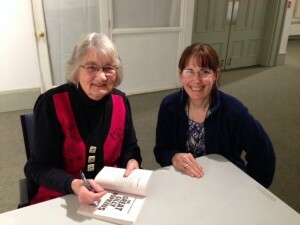 Did I mention that Katherine Paterson came to my winter 2012 workshop with Bonnie and Leda to talk about her research process? She has served as a mentor for countless VCFA students and faculty in addition to inspiring us with dozens of outstanding children’s books published over the past five decades. Many of our faculty and graduate lectures this residency referenced The Great Gilly Hopkins, Jacob Have I Loved, Bridge to Terabithia, and other titles. 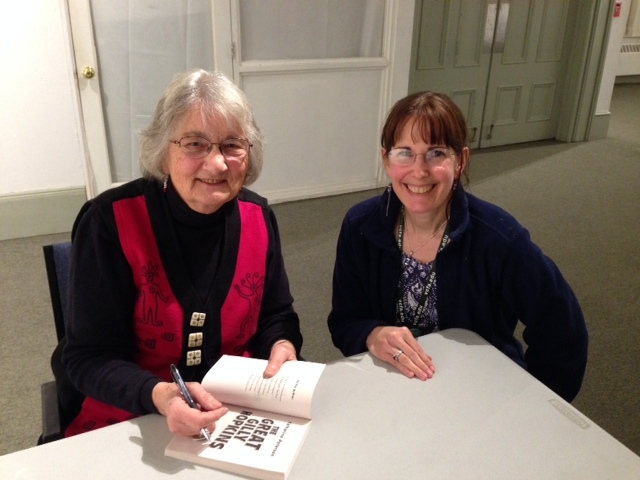 Katherine Paterson signs a book for first semester student Diane Telgen. Along with these events, I’ve once again appreciated the lectures from faculty and graduating students. Every residency has its individual character, and while this one didn’t focus on diversity, the graduating Darling Assassins had much to say about the writing craft and sources of inspiration. Two lectures I found especially useful were my friend Susan Korchak’s on writing protagonists with invisible differences, particularly dyslexia, and Anna Craig’s lecture on going beyond stereotypes of mean girls to portray authentic and nuanced female friendships. She made the important point that girls who exclude others (and portraying such girls as the norm) create the conditions for excluded girls to seek connection and protection with men in a way that reinforces the vulnerability and subordination of those young women. In short, female bullying and relational aggression contribute to women’s subordination to men and to patriarchal social structures. 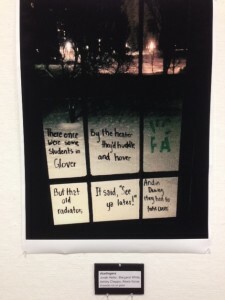 At the “Poetry Off the Page” exhibit, VCFA students reflect on the winter residency of the cold. As a graduate assistant, I also help the first semester students to navigate the program and bond with their classmates. The winter residency has traditionally offered a bonding experience rooted in hardship. The Darling Assassins’ first residency was the residency of the pestilence, in which a third of the students and faculty came down with the flu. One of my winter residencies was the one of the famine, when the cafeteria ran out of food. This residency was the residency of the cold. Half of the days here, the temperature barely reached 10 degrees, with lows between -10 and -20. The heat went out in one of the student dorms, forcing many students to crowd into the other dorm. It also went out in part of College Hall. Sitting through lectures and readings, especially at night, was a chilling experience. But we survived, we supported each other in times good and bad, and we return to the world taking strength in having been together and overcome our challenges — just as Bonnie would have wanted us to. From A.B. Westrick: Fabulous post, Lyn! Oh, how I miss VCFA! I remember that “residency of the cold”! Brrrr…. Your highlights from lectures inspire me to dig deeply into my own writing this morning. Thank you! My reply: Thank you, Anne! You should come back as a GA too! I think most of the residencies here in the hills of central Vermont in January are “residencies of the cold,” though some feel more cozy while others are harsh.